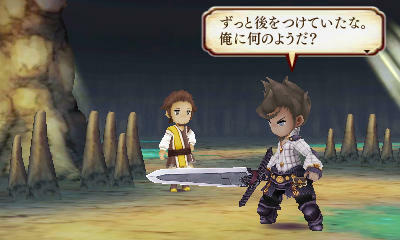 Man, when was the last time a JRPG only allowed us to use three characters per battle? Lost Odyssey maybe? I only ask because the latest trailer from The Legend of Legacy features just three characters, and it looks so ridiculously limited in the challenges and customization it can provide. Of course, this is the just the combat at its most basic level, displaying how every character in the game has a role to play. You have a damage dealing knife wielder, a tank to soak up all the damage, and a healer to make sure the tank can withstand a barrage of hits. Plain and simple. What makes it even more limiting is knowing that the game lets you choose the three characters from the beginning, and you are stuck with them until the end. If you don't make a likable combination of the three, then there's not much to do besides start over. You have seven characters to choose from, and I can't think of anyone who wants to play this game and not use the frog prince Filmia. On a bit of a bright note, though, I am a huge fan of the stat raising system. Like the SaGa series, where it takes most of its inspiration, The Legend of Legacy does away with traditional leveling up and replaces it with stat boosts at the end of every battle. Your stat bonus depends on the actions you make in battle, meaning that if you defended allies, you might get an HP or a defense bonus. If you healed a character, you might get magic or an SP bonus. It's a mixed bag in this trailer, but like with most games from the creators behind it, you can't really judge it until you get your hands on it. Nothing is as it seems when you are dealing with SaGa veterans. I really hope this gets an official English translation.